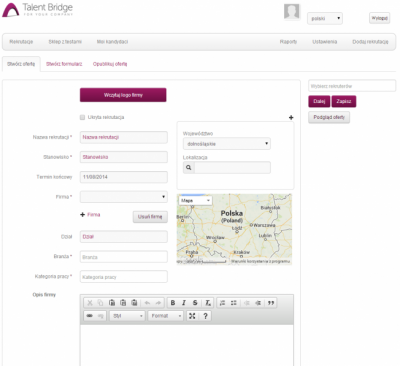 For Talent Bridge, we have developed a recruitment system that allows them to identify competencies through psychological tests and allows for shortening and automating recruitment processes. Design and develop a system with all the required functionalities and website presenting the product. Collaboration have started with a deep analysis of customer’s requirements and preparation of technical specification. After its acceptance, we have started working on the interface of the system and then proceeded to development work. The final step was detailed qualitative tests and performance measures, accuracy of results, and integration with Facebook. Execution of all programming work, graphics and implementation. Implementation of quality and performance tests. Design and development of the sales page. Have we piqued your interest? Would you like to take a look at our offer?